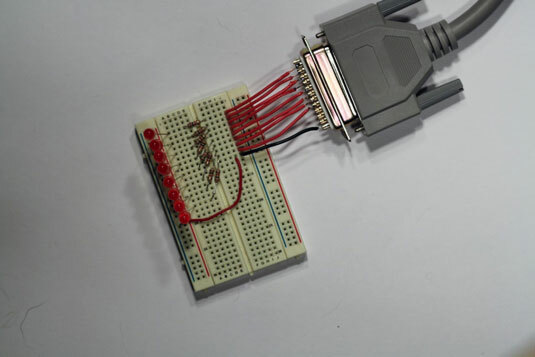 This electronics project presents a simple breadboard circuit that connects eight LEDs to the eight output pins of a parallel port. To complete this project, you need to have a computer with a parallel port, and you need to install the Kit 74 parallel-port software. To connect the Kit 74 board to a computer, you need a printer cable with a DB25 male connector on one end and a DB25 female connector on the other end. 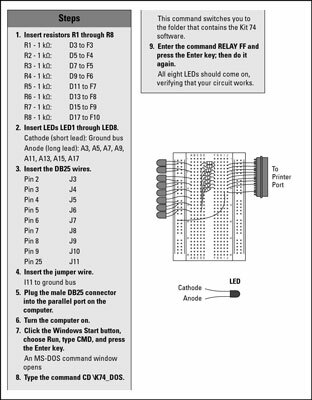 You may need to run the command twice to make the LEDs turn out. This requirement is due to a flaw in the RELAY command itself, not to a problem with your circuit or your computer’s parallel port. 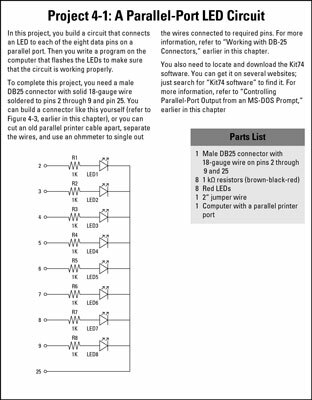 Once you have completed this project, the finished parallel-port LED flasher circuit is connected to the male DB-25 connector on one end of a parallel printer cable. The other end of this cable is connected to the computer.